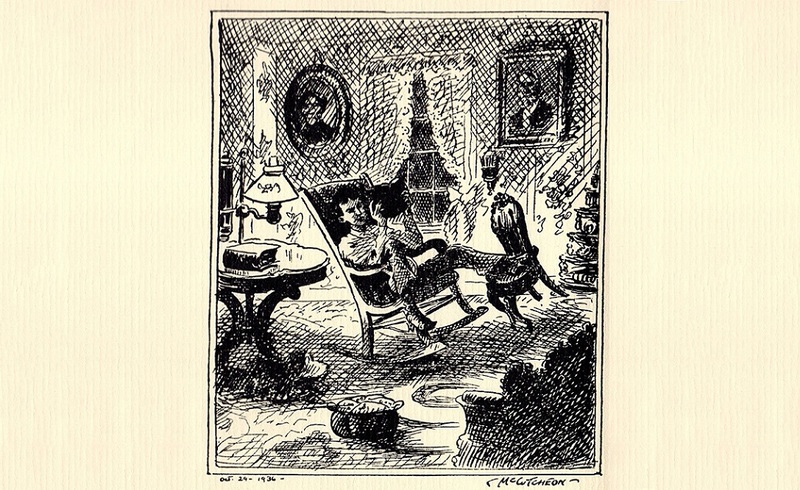 “Ade at Fourteen Reading Mark Twain — ‘I think I had read everything he ever wrote.’” Frontispiece illustration by American political cartoonist John T. McCutcheon (1870–1949), for George Ade’s One Afternoon with Mark Twain, 1939. Thank you once more for introducing me to the incomparable Pink Marsh. I have been reading him again after this long interval, & my admiration of the book has overflowed all limits, all frontiers. . . . And for once—just this once—the illustrator is the peer of the writer. He was rereading George Ade’s book, Pink Marsh, published a decade earlier. The title character, a black shoeshine boy, was one of several personalities created by Ade for his popular column, “Stories of the Streets and of the Town,” in the Chicago Record newspaper. John T. McCutcheon, a fellow Purdue University classmate and fraternity brother who would later become one of America’s best-known political cartoonists, provided illustrations for the series, which was reprinted in eight annual book collections during the 1890s. It was in the late summer or early autumn of 1902, as nearly as I can fix the date, when Dr. Clarence C. Rice, a long-time friend and traveling-companion of Mark Twain’s, came to me at my hotel in New York City and invited me to accompany him on a pilgrimage to the One and Only. Of course I accepted the invitation. Probably no person, then alive and gifted with a pair of movable legs, would have done otherwise. . . . If I had known that I was never again to meet Mark Twain, I would have come provided with a handful of pencils and my pockets bulging with copy paper. I would have carefully recorded the date, the state of the weather—every word he spoke, every trifling detail of that pilgrimage to the shrine of this immortal American. 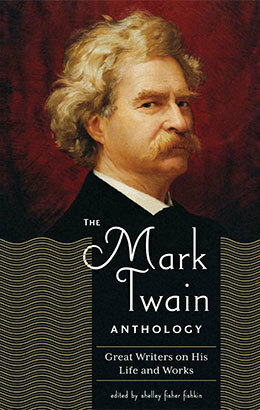 At the end of 1910, the year Mark Twain died, Ade published “Mark Twain as Our Emissary,” a tribute to his idol’s remarkable popularity both at home and abroad. We present it below as our Story of the Week selection, with a brief headnote by Shelley Fisher Fishkin that offers additional information about Ade. Notes: Popular from the 1880s to the 1920s, Chautauquas (mentioned on page 122) were assemblies, often hosted in large tents, bringing lecturers, scholars, entertainers, and preachers to rural American communities. William Waldorf Astor, who for many years was the wealthiest man in America, moved with his family to England in 1891 and became a British subject in 1899. Ade uses the German words stube (room, lounge) and rathskeller (the cellar of a municipal building, often used as a beer hall) to refer mockingly to Mark Twain’s “headquarters” when living in Vienna. Edward Payson Roe and E.D.E.N. Southworth were two of the most popular American novelists of the latter half of the nineteenth century. For over forty years, beginning in 1859, actor Joseph Jefferson (page 123) played Rip Van Winkle in productions across America and at the turn of the century even appeared as the character in several silent movies. Maud Adams became the highest paid stage performer in the nation after playing the title role in the 1905 Broadway production Peter Pan. The father of William Randolph Hearst, businessman George Hearst (page 124) was a U.S. Senator from California for five years, until his death in 1891. In 1832 Frances Trollope published Domestic Manners of the Americans, which was sharply critical of American religion, politics, and social mores. In 1839 British naval officer Frederick Marryat published Diary in America, which was similarly disdainful toward U.S. culture. The term Cook tourists was shorthand for vacationers who purchased tour packages of the type made popular by English travel agency Thomas Cook & Son. Mark Twain had a large following of admirers who came to regard themselves as his personal friends. Many of them he never met. Most of them never saw him. All of them felt a certain relationship and were flattered by it. . . . If you don't see the full selection below, click here (PDF) or click here (Google Docs) to read it—free!